A cold, dark night at sea....a mighty ship being ripped apart by the elements...two lovers separated by untimely death....add a swelling soundtrack and Celine Dion bellowing "My Heart Will Go On," and you'd have the mega-hit movie, Titanic. But, no...this isn't the tragic story of Jack and Rose, and nobody's singing. It's "The Interrupted Voyage," one of the rarest Dark Shadows collectibles. Published in 1970 by Gold Key, "The Interrupted Voyage" was a one-shot cross between a novel and a comic book. Gold Key brought us the popular 35-issue Dark Shadows comic book series (from 1969 to 1976), but the company also produced this lesser-known volume, called a "Story Digest Magazine." Writing credit goes to D.J. Arneson, and the book is illustrated by Joe Certa, the artist who drew the entire run of the comic series. I don't know if this book had a lower pressrun than the comics, or than the paperback book series, but I suspect this is true. In my years researching the DS collectibles, I've only seen a few of copies of it (one of which, I happily own). 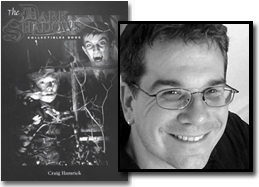 The story isn't bad, but it's not really linked to the "world of Dark Shadows" as we know it. The only familiar characters are Barnabas and Angelique -- and the lovely witch doesn't enter the action until near the end of the story. References are made to Barnabas' silver wolf's head cane, so we'll remember this is a DS tale...but our hero isn't suffering from the vampire curse and he never seems to give a thought to his 1970s family members, such as Carolyn and Elizabeth. 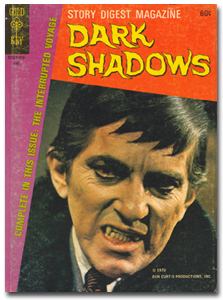 The book contains about 30 full-page drawings, colored in black and either green or purple -- and drawn in the same style as Certa's comic book work -- which is to say, Barnabas is a good-looking fellow, but he really doesn't resemble Jonathan Frid. Still, if you're a serious collector of the DS comics, your collection really isn't complete without this volume. As the story opens, Barnabas notices a pale blue light in one of Collinwood's many windows. When he investigates, he discovers a secret room inhabited by the ghost of his long-dead cousin, Annabella. The sad, beautiful spirit tells Barnabas the tale of her death in a shipwreck off the coast of Salem many years earlier. As she sank beneath the waves, Annabella vowed not to rest until she was joined by her beloved Michael, and as of 1970, he hasn't shown up in the hereafter. Barnabas deduces that Michael's soul must be imprisoned by a witch, so together he and Annabella journey to the day of the shipwreck to find Michael and break the spell. When Barnabas arrives in Salem, he is shunned by the inhabitants, who for some unexplained reason are immediately certain he is Satan. 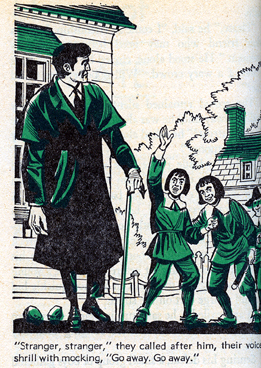 He is taunted by the town's children (who, in one of Certa's illustrations look suspiciously like the Oompa Loompas from the movie Willy Wonka and the Chocolate Factory), and eventually ends up tied to a stake as a suspected witch. 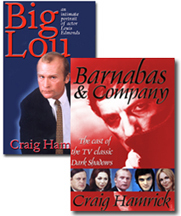 Does Barnabas save the day? Does true love conquer all? You'll have to find a copy of this rather oddly-sized (4.5"x6.5") book to find out.